This is a real treat for wing lovers! 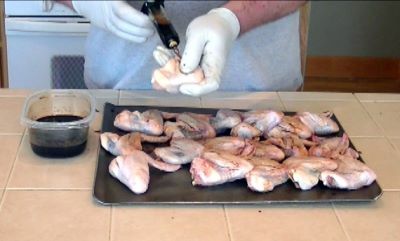 Start out by rinsing the chicken wings and pat drying them with paper towels. 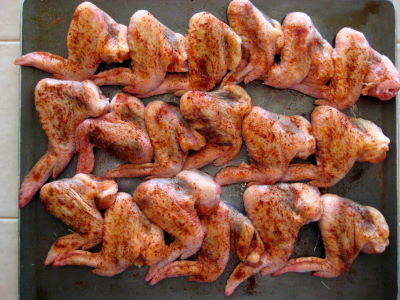 Arrange the chicken wings in three rows on a cookie sheet so they are easy to pick up and deal with. This will make enough Teriyaki flavor for injecting. Using a flavor injector insert the needle into the end of the wing and push it in to the opposite end. Be careful not to breach the skin. Slowly inject the Teriyaki sauce until you feel pressure pushing back. Slowly inject as you slowly pull the injection needle out. This method allows for even distribution of the flavor your injecting. To much pressure and the sauce will squirt at you as you withdraw the needle. Once done you can shower off the wings in the sink to remove any excess sauce. Now that the wings are injected with flavor, start applying the Jack's Old South dry rub. Season to taste. Make sure you apply to both sides of the wings. 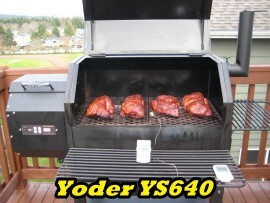 Once seasoned place them on the grate of your smoker, close the lid and smoke @ 230 degrees. That's right, low and slow until the wings reach an internal temperature of 150 degrees. In a small bowl mix 1/2 cup hot apple juice and 1/4 cup honey. Mix this up good. Now its time to start mopping the wings with the Honey glaze sauce every 30 minutes or so. This will allow for a thin but sticky honey glaze to build up on the outside of the wings. After the first mopping you can sprinkle on some sesame seeds. I opted the last minute not to. 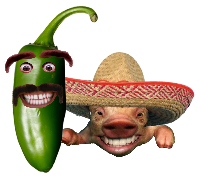 They just looked to perfect as they were. This is also a good time to put on a pan of beans to go along with your wings. I always like to add a Tbsp of brown sugar and some bacon to my beans. Stir the beans the same time you mop the wings. In fact recently I tried pineapple chunks as in addition to the bacon and brown sugar. it was a big hot with my family. 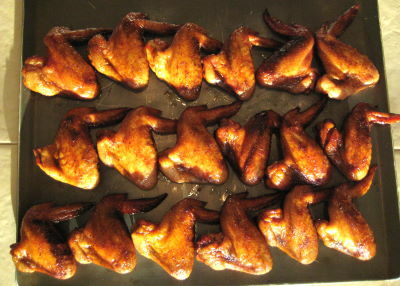 When the wings reach the 180 degrees temperature, remove them from the smoker and let them cool a bit.